Differentiated A3 worksheets with illustrations enable students to learn, practise and apply board-specific topic vocabulary for the new specification GCSEs. Through Foundation or Higher activities, students build their knowledge of the themes and topics in structured stages. Activities range from fun games and quick tasks to more difficult translations and writing questions, for an enjoyable learning process that simultaneously hones students’ skills for the exams. 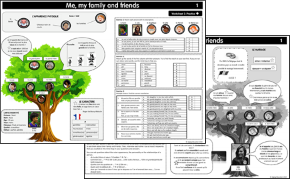 Co-teachable: Teachers select Foundation or Higher worksheets – perfect for mixed ability classes! Match-ups, multiple-choice, true or false, finding synonyms and more! Upgrade to PDF to receive the A3 worksheets in colour. Select this from the dropdown menu in the basket.